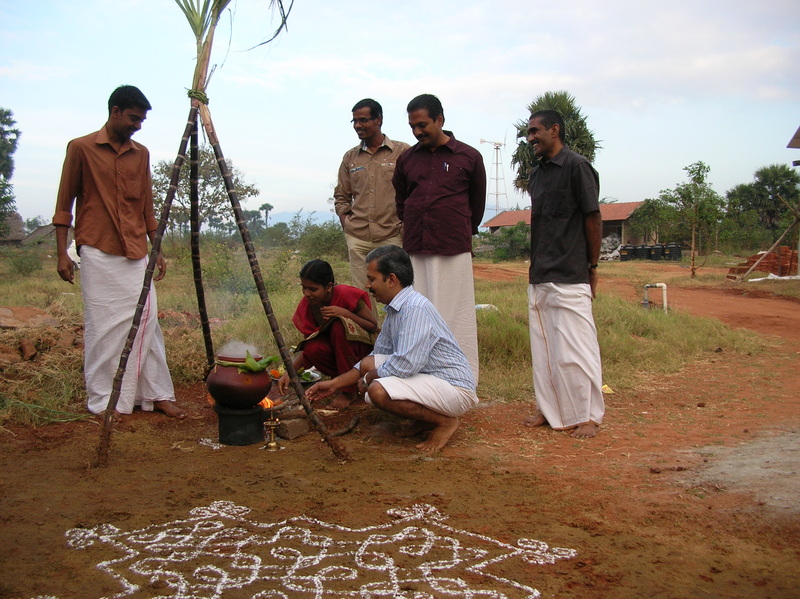 Last weekend was Pongal, the annual harvest festival. It is similar to our Thanksgiving – they give thanks for the harvest and for the generosity of the earth. It also marks the transition between early winter and late winter (they recognize six discrete seasons here). It is the only Hindu festival that is observed on a fixed date on the Gregorian calendar – most Hindu festivals are determined by the lunar calendar, so the actual date changes every year, but Pongal is always celebrated around Jan. 14. Some theorize that back when Pongal was first celebrated however many millennia ago, it was a winter solstice celebration and now, due to the tilt of the earth’s axis, the solstice has gradually migrated a few weeks earlier. So Pongal is like Thanksgiving and winter solstice wrapped up in one. The Pongal celebrations span about four or five days – we heard music and drums wafting over the trees from the nearby village for several mornings. 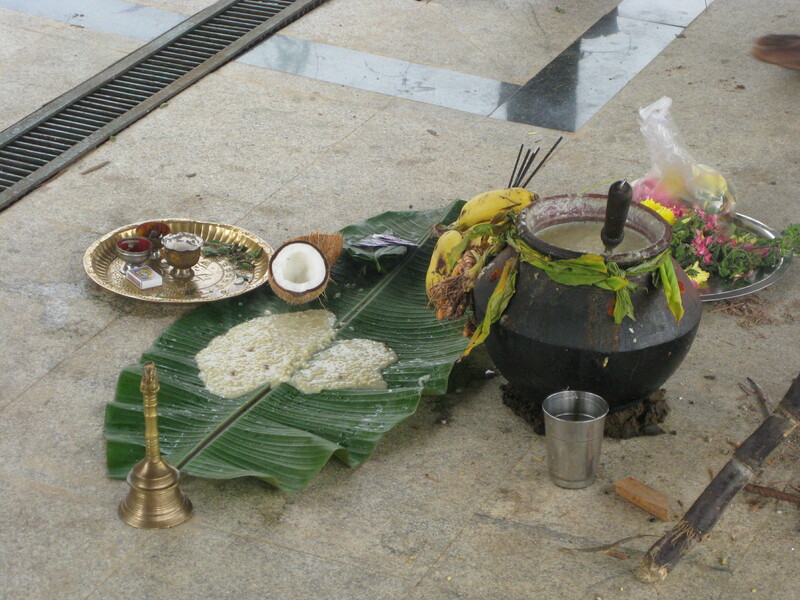 Different pujas or ceremonies are conducted on each day of Pongal to honor different aspects of the harvest. On Saturday morning, several of the staff conducted a small puja at the entrance to the building complex. They built a fire under a tripod of sugar canes and heated milk in a new clay pot that was tied with the leaves and roots of a turmeric plant. The intention is to boil the milk until it runs over the edge of the pot (a recurring theme, we’ve learned) and then cook a sweet rice pudding. One of the male doctors (Dr. Om – that’s really his name!) created a line drawing on the ground using white rice flour, and he explained that usually the women and girls do these designs, but for some reason, today there were only men setting up the puja. After the milk had been on the fire for quite some time and was decidedly not boiling, they got Indu, one of the women, to come attend to the fire. Someone got the idea to use the offering platter as a lid, so they removed all the offerings, put the platter on the pot, and indeed, the milk boiled over. Quickly they put the offerings back on the platter and raised it in the air and everyone cheered, “Pongala Pongal!” and that was that. 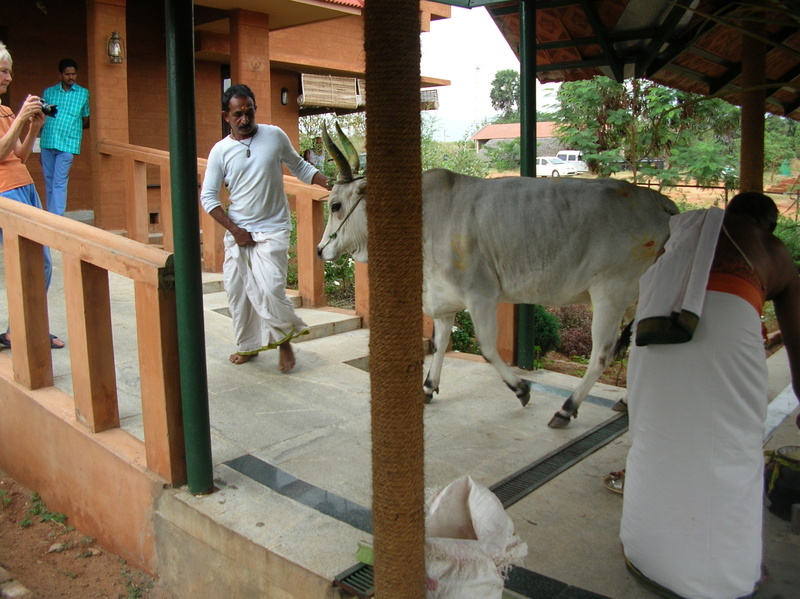 The next day, we had another puja specifically to honor the cows. The cows were decorated with colors and are not worked that day, given a vacation in honor of all they provide us. Again, we had a fire with the sugar cane tripod, but the big difference, of course, was the cows. They brought two of them up on to the tile pathway, climbing up four steps to get them by the fire. 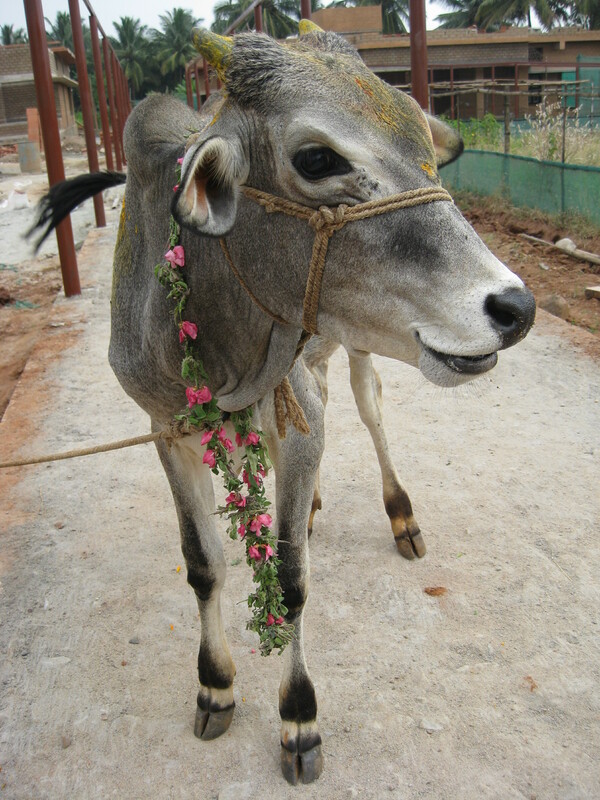 At the direction of the priest, the two head physicians, Dr. Ramdas and Dr. Ramkumar, each honored one of the cows by chanting and placing flowers on them. 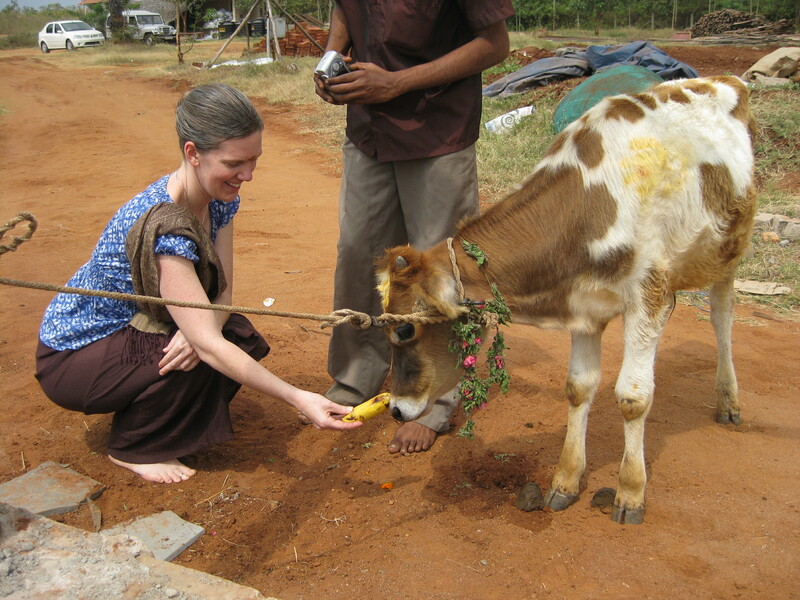 Then each person in turn passed by the cow and threw flowers, and some of us even got to feed them a banana treat. They eat them peels and all. I was struck by the realization that in all my years of drinking milk and eating yogurt, I had never touched a cow. I had never actually said thank you to a cow, face to face. Their hair is stiff and oily and warm, and their eyes are deep and sweet. Standing next to these particular cows, such well-loved members of this community, you could feel how such celebrations come about – it just makes perfect sense to honor the cow. That evening, our group of three grew to four – but in an unexpected way. After Lynn and Ras and I arrived at Vaidyagrama last week, we learned that a woman whom none of us knew was joining us. Meera had inquired about studying at the Institute in October, but it was too late to join the first year class. Somehow she heard that a small group of us was going to India to study so she got in touch with Vaidyagrama. Originally from Canada but with family roots in India, Meera had studied Ayurveda for some time and felt she was up to the task of jumping in and catching up as we went along. So we have lost one and gained one before we even started classes. The next day, Monday, an hour in to our first class, our dear friend Emily arrived straight from the airport after flying for over 30 hours to get here from Brazil after two months of traveling there. Now our group is nearly complete, but our last member has been delayed. Ursula, our classmate from Switzerland, has had a last minute passport issue and is not going to be able to join us until Feb. 9. Now our first week of classes is drawing to a close, and our time with Dr. Ramdas has been illuminating in so many senses of the word. More details will have to wait – my bed is calling me. Thanks Kel! So lovely to get your note. And thank you for your good “settling in” vibes via email last week. We are indeed settling in so incredibly well. You would just love it here! I am sending settling in vibes right back at you – I hope your first three weeks of classes have been as illuminating as you can possibly wish for. Much love to you! Big smile on face at the resourcefulness of women around the globe! Even bigger smile as I savor the pure pleasure of reading/seeing the vivid pictures in your writing, Ivy. Even the cow at the bottom of your post is smiling! Love you SO. Yes, we are a resourceful bunch, aren’t we? I love YOU so too! Isn’t it though? And we’ve seen so many around in the villages… I don’t know if they are just left over from Pongal, or if they re-do them with some frequency just for the beauty of them… or maybe for other holidays too-? They are lovely things to see.